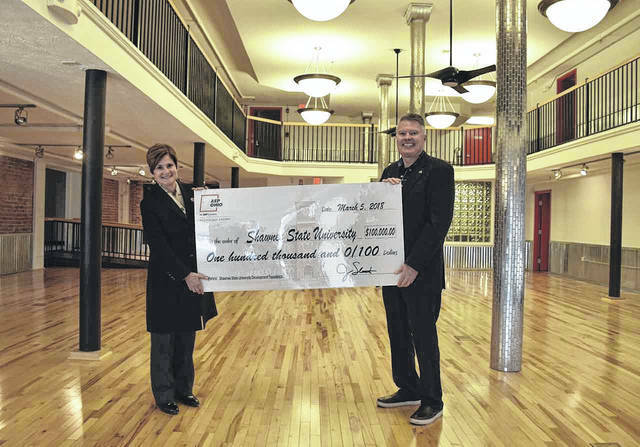 Shawnee State University Development Foundation (SSUDF) has received the final installment of $100,000 from the American Electric Power (AEP) Foundation to fund SSU’s Innovation Accelerator Project. The AEP Foundation pledged a total of $200,000 to the project. The funds from the AEP Foundation will be dedicated to interior renovations, with an emphasis on high-tech meeting and planning rooms, as well as furnishing the buildings with computers and other peripherals. These rooms will be the focal point of the Accelerator; it will provide the opportunity for collaboration, conferences and use of advanced technology, including the connection to Ohio Academic Research Network (OARNet), a super high-speed internet connection funded by the state of Ohio. The Innovation Accelerator will serve as a central meeting location for local government, businesses, SSU campus and hotels in the downtown area. It will be a place where SSU students and citizens can innovate and collaborate with successful community and business leaders, as well as current and future entrepreneurs. The shared campus-community facility will serve as an outlet for outreach programming, supplied by University resources and existing partners. The AEP Foundation is funded by American Electric Power and its utility operating units, including AEP Ohio. The Foundation provides a permanent, ongoing resource for charitable initiatives involving higher dollar values and multi-year commitments in communities served by AEP and initiatives outside of AEP’s 11-state service area. The Foundation focuses on improving lives through education from early childhood through higher education in the areas of science, technology, engineering and mathematics, and by meeting basic needs for emergency shelter, affordable housing and the elimination of hunger. Other Foundation support may be offered to protect the environment, support healthcare and safety, and enrich life through art, music and cultural heritage. The Foundation is based in Columbus, Ohio.